So, you decided to go out and kill some animals? Well, people have done that since we learned how to use tools. Surviving was the name of the game then, but today we hunt for sport and in place for all the predators that are gone now. 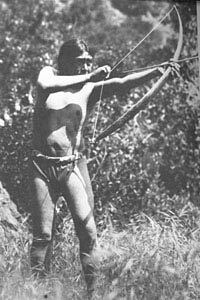 The tools of the hunting trade is much more sophisticated than what Ishi, the Indian in the picture above used. 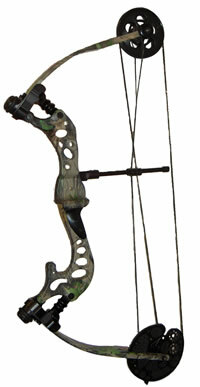 Today’s hunting bow looks more like this. I have hunted with shotgun, rifle and handgun but never with a bow so lets that part be out of here. Can’t talk about something that I know only in theory. The first guns used blackpowder to propel an arrow in the beginning, rocks and lead bullets a few years later. 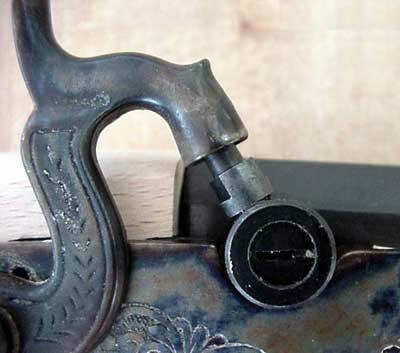 Just a few years before 1500 the rifling was invented. To rotate a projectile gave it stability and those better range and accuracy. In the 1800 century the gun was loaded from the front with blackpowder and a bullet and then a percussion cap ignited the charge. That type of guns is still used today (where the law permits them) for hunting; the power of them is good enough if one knows how to use them. From the middle of the 1800 century and forward the metallic cartridge case was the top trend to follow if you had the money for it. Names like Mauser, Winchester, Manlicher and Browning made guns that we still see today. Mauser’s model 98 is still in production today. .17 calibre and up to include bigbores with a .700 calibre bullets. The last one uses a 1000 bullet in front of 250 grains powder, Velocity around 2500 foots per second. An ordinary 300 Winchester Magnum with a 180 grains bullet generates about 21 in KO formula, the 700 NE generates about 250 KO. And I thought that my .460 Weatherby was a big bore with KO about 95. Been hunting here and there but never with a bow or a black powder loaded gun. So my knowledge about them is only theoretical. Iv built and shoot blackpowder guns in both cartridge and frontloading types and lost of people use them for hunting where it’s permitted by the law. I have a hunting compound bow made by Browning and it’s only used for fun target shooting. Let’s keep this to handguns and rifles. Whatever gun and cartridge combination one is for sure: you must be able to use it well and it must be powerful enough to kill instantly. Some of the handgun cartridges of today are more powerful than small and medium type rifle cartridges. Some handguns use rifle cartridges and if you handload them with a faster burning powder you will be able to get real velocity even with the shorter barrel of the handguns. A TC contender for example can be used as a handgun but changing the handgrip to a rifle one and you have a short barrelled rifle to use. 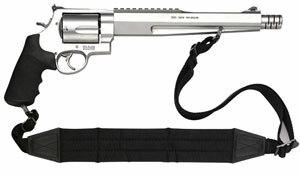 Below, the S&W cal 50 handgun customized for hunting duty. Some hunters go to the store and ask about a packet of cartridge for hunting for theirs calibre. Iv seen and heard customers coming in and ask me about hunting cartridges for theirs 30-06 or whatever. When I give them a packet of ammo they look at it, see the calibre designation and are happy with that. No questions about the velocity, the bullet and the intended prey that load are designated for. Ammo manufacturing is a harsh business. They have to compete with each other to get your attention. Sometimes they do that with velocity numbers. Trying to get the most of a cartridge just like the car manufacturers. In Sweden the word Magnum became associated with the 7mm Remington Magnum and 300 Winchester Magnum in the early 1960. In the beginning they used a lot of light bullets to get the high velocity or a medium weight bullet in high velocity for longer range. Take one of those cartridges intended for mule deer in West US at ranges around 200-300 yards and shoot a Swedish moose in fewer than 100 yards range and you sure get a failure. If the moose can be found dead a while later the hunters complain about meat destruction. And I say if, 'cause that bullet is going to get apart and never reach the vital organs of the moose. Nothing wrong with the cartridge/load combination but NOT on moose and NOT in that range. Africa and yours BIG Game hunting there. You don’t have so much to choose from and if you are after the big ones the minimum calibre would probably be .375. What’s more important than yours ordinary hunting is the gun you are to use. If your gun malfunction when hunting mule deer or turkey so what? Your trip to the woods are ended abruptly but if the gun malfunctions when a Cape buffalo charges against you.............do I have to say more? You are not alone when hunting in Africa, you always got a Professional Hunter with you and he is probably armed with big cannon for gun so he can protect you. Right? Well yes, but you are not going to pay a lot of money for the hunting trip and let another guy shoot your Buffalo?